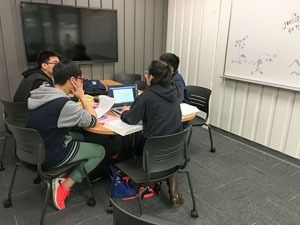 Group Study Rooms are for 2 or more people. Students may reserve a room for up to 2 hours per day. Rooms may be reserved up to 2 days in advance. If your group is more than 15 minutes late for your reservation, all the blocks of time you reserved may be cancelled. Food is not allowed. Covered drinks are okay. Book a room by selecting the green time slots, which are 30 minutes each. You may book up to two hours (four time slots) per day. You will receive a confirmation notice at the email address you provide in the reservation form. If you cannot find the confirmation email in your inbox, please check your spam or junk folder for a message with the subject line: “Your booking has been confirmed!” Should your plans change, you may cancel the reservation from within the confirmation email. Be sure to bring your confirmation with you (either print it or have it on your phone, etc.) in case there is a group in the room when you arrive.